Hands holding three books in front of a yellow wall. Books are "Cortical Visual Impairment: An Approach to Assesment and Intervention," "Vision and the Brain," and "Cortical Visual Impairment: Advanced Principals"
April is CVI Literacy Awareness Month! To help celebrate, we want to share some of our favorite CVI specific products! Close up of hands using red and yellow craft materials. 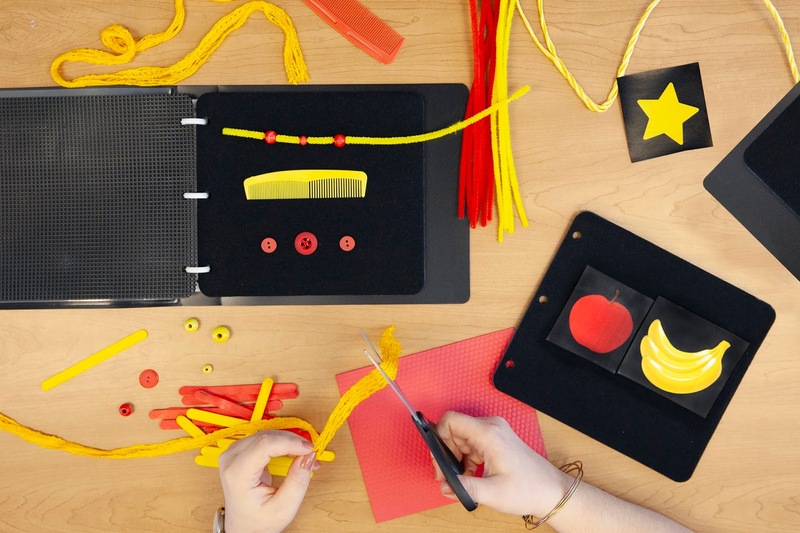 The CVI Book Builder was created for children with Cortical/Cerebral Visual Impairment (CVI). The kit makes it easy to create meaningful books that provide a foundation for literacy for young learners. 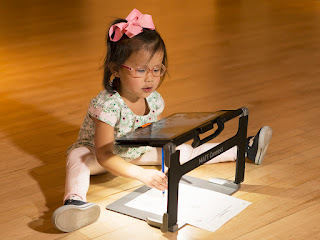 Because children with CVI often have difficulty in understanding objects, pictures, and letters presented against a complex background the CVI Book Builder takes a different approach. In the kit you’ll find black pages and black binders that serve as low complexity backgrounds where you can present familiar items, photos, and eventually words. The CVI Book Builder manual guides parents and teachers in creating individualized books specifically for their reader with CVI. 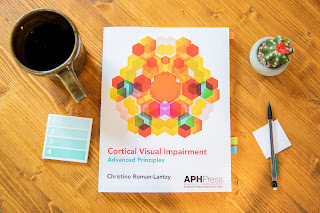 This companion book to CVI: An Approach to Assessment and Intervention makes new strides in building knowledge about CVI. The book, a collaboration among experts in several disciplines, dives deeper into topics that are extensions of the original concepts. The book offers an in-depth examination of the needs of student and individuals with CVI in areas such as literacy, social skills, and O&M. 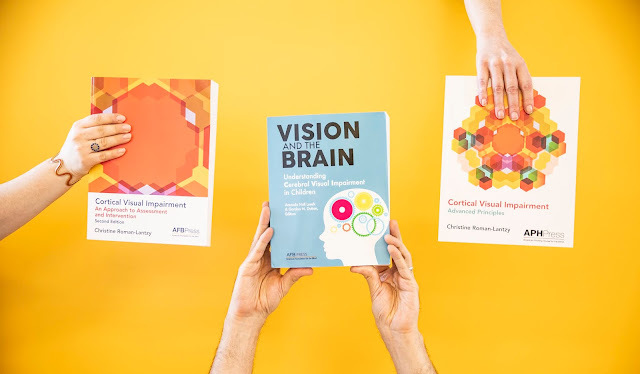 Author Anne McComiskey maintains that the vision of children with CVI can be most effectively improved when interventions are started as early as possible. There are, unfortunately, obstacles in implementing early interventions. The diagnosis of CVI can be especially confusing to new parents. They are bombarded with new and seemingly conflicting terms. They are worn down by the many appointments their baby has with doctors, therapists, and other support professionals. At the same time, parents of babies newly diagnosed with CVI are often struggling with feelings such as grief, anxiety, and fear. This early struggle often means that parents often do not realize that there are appropriate, effective and time specific methods to enhance their babies' vision until months or years after the diagnosis. This important book offers guidance to teachers of children with visual impairments as well as to families to ensure that babies with CVI receive appropriate interventions as early as possible. The anticipated release date of this book (title to be determined) is late 2019. CVI: An Approach to Assessment and Intervention provides educators, therapists, physicians, and parents of children with CVI with an understanding of the condition and a complete framework for assessment and intervention. The CVI Complexity Sequences eBook and Interactive cards makes our product CVI Complexity Sequences Kit easy to take on-the-go. This eBook works to help refine your child's ability to identify a target in the presence of background information which is a foundational early literacy skill! Vision and the Brain provides current research and thinking on CVI including: the role of the brain in vision; effects of brain damage on vision; impact of CVI on child development; consideration in behavioral diagnosis; CVI, autism spectrum disorders, and ADHD; eye movement disorders in children with CVI; and refractive errors and impaired focusing.